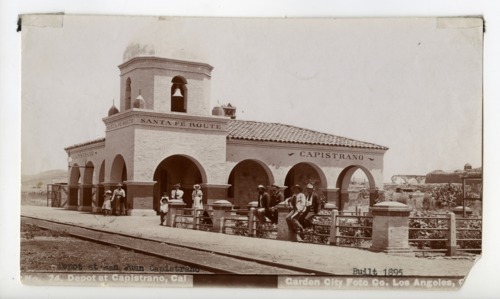 This sepia photograph shows the Atchison, Topeka & Santa Fe Railway Company depot in San Juan Capistrano, California. The Spanish Mission Revival style structure built in 1895 served as a depot until 1974. It was later remolded into a restaurant. Men, women, and children are visible standing on the platform in front of the depot.